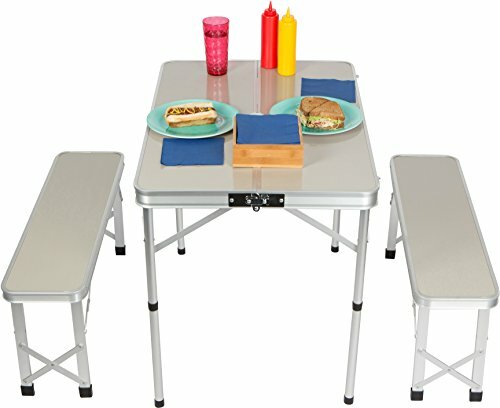 Bring along this easy to set up aluminum frame picnic table and bench set to your next picnic or tailgate party. The table measures 35.4"L x 24.4"W x 27.5"H and can hold up to 66lbs. Each bench measures 34"L x 9"W x 15"H and each has a weight capacity of 350lbs. The table folds flat and each bench can fold and snap into place within the table frame for easy portability. The set weighs 17lbs. So it can be easily transported from event to event. This tabletop should not stay wet. Wipe away any liquid promptly. Made with superior quality by Trademark Innovations. The tabletop is made of MDF. Should not stay wet. Wipe away liquid promptly. AP290 Afford A Stand Portable Trade Show Table, Home Bar Table, DJ Table Comes Complete with 3 High Quality Carpet Cover, White, Black & Grey. Includes a 600 Denier Polyester Cary Case. Holds up to 100 pounds distributed weight!